Cinque Terre National Park is one of the most beautiful places in the province of Liguria, Italy. The five fishing villages each have colorful houses tucked in the northwestern coast. Here’s everything you need to know about gehttps://www.incinqueterre.com/en/manarolatting to and from this UNESCO World Heritage Site. The closest airports to Cinque Terre are Genoa, Pisa, Florence. Regardless of your starting point, you have to first get to La Spezia train station where you can buy day passes to the villages. 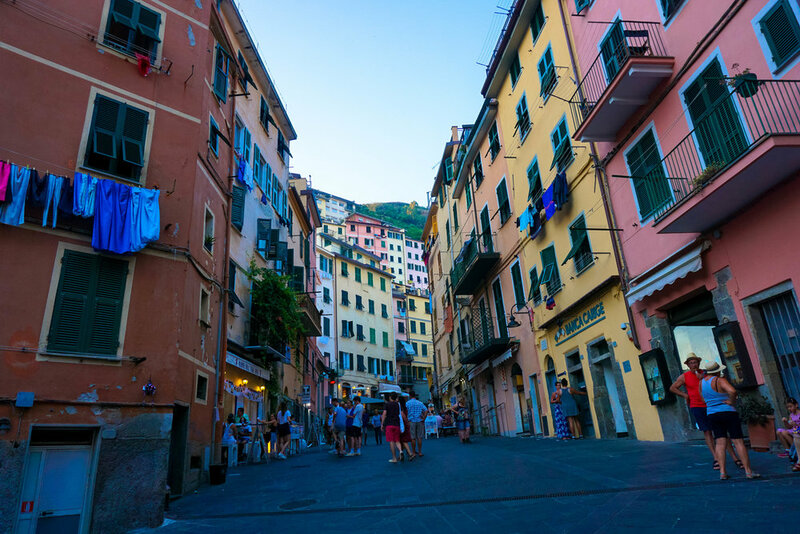 Once you get to La Spezia station, you’ll need to buy a Cinque Terre Card if you plan on hiking or just visiting any of the five towns. A one-day pass will cost about 15 euros. There is a tourist desk inside the middle of the station, where you can purchase your card. Make sure to get it validated (punched) in any of the green machines on the walls of the train station. Trains run frequently (every 10-15 minutes or so), and it takes 20 minutes to get to the northernmost village, Monterosso. It’s easy to get from one town to the next by train, though in the summertime (high season) they can get very crowded. However, the distance between each location is not long (anywhere from 5-15 minutes.) Alternatively, there are buses and ferries to and from most of the villages. If you book in advance, you can find a place to stay in any of Cinque Terre's five towns, but it will be pricey. Consider staying in La Spezia - this will allow you to wake up and go to any of the towns very easily. Alternatively, you could stay in Portovenere, another Cinque Terre-like town with colorful houses, but it is a bit of a trek from the official Cinque Terre Park itself. To get to Portovenere, you’ll need to take the “P” bus from La Spezia (about a 10-minute walk from the station), and it takes about 45 minutes one way. Monterosso <—> Vernazza ~3 hours. Vernazza <—> Corniglia ~2 hours. Corniglia <—> Manarola ~2.5 hours (if the cliffside trail is not closed off, this hike would only be ~40 minutes). Manarola <—> Riomaggiore* - Trail is closed (would typically only take ~20 minutes along the cliff). The trail between Monterosso and Vernazza is difficult. There are a lot of stairs since you are going up into the mountainside. The trail between Vernazza and Corniglia is moderate, but may also depend on which one you start from. If you are heading from Vernazza to Corniglia, there is a downhill at the end that leads into the smallest village. Corniglia to Manarola was also quite hard, but maybe the most beautiful - you end up in the middle of a hillside vineyard and the view is breathtaking. At one point, you also end up in someone's backyard which is a little awkward. But just keep going and follow the trail signs. The trails are marked by a pairing of red and white paint stripes. These two horizontal stripes are everywhere along the trail; it is near impossible to get lost. Bring a lot of water. If you run out on one leg of the hike, fill up or buy more at the next town. Wear shorts and breathable clothing or a bathing suit; you will see a lot of people hiking in swimwear. Unless you’re super ambitious, break up the hikes into two days. While there, try focaccia with the region's claim to fame: pesto. Seafood and local wines are also a must-try. Largest of the five villages and very crowded/touristy. Has a large beach and a smaller one. The larger one you will see directly when you get out of the station. It will take you to a promenade with shops, restaurants, cafes, and bars. At the beach, you can rent a chair for the day or bring your own towel. Note that the beaches are pretty rocky both in and out of the water. Popularly known as the most beautiful of the villages, it is very picturesque, especially on the trail between Vernazza and Monterosso. There are many focaccia/ pizza places and hoards of people waiting to catch the ferry. It has a small beach with turquoise-colored water. There is also a small cave in the village that you can walk through/under where you will see people swimming in a small inlet the other side. The quiet middle village, there are not as many tourists here compared to the others, possibly because it is more inland than the other towns, or possibly because it’s the smallest town. Corniglia is best known for its local wines - try a glass at any of the restaurants. If you walk further down toward the coast, there are some bars that have seaside views. Another quiet village; has bars and restaurants as well. It is the second smallest village and also claims to be the oldest of the 5 Terres. It is also known for its sweet Sciacchetrà wine. One of the buzziest towns. A lot of bars and trendy-looking restaurants. Looks really beautiful at night as all the street lamps light it up. It is the southernmost town and the first stop on the train from La Spezia station. Take lots of pictures and enjoy!